Not long ago, I decided to evaluate the several keys I received when I bought my 1959 Mercedes-Benz Type W180 220S Ponton cabriolet. In addition to the ignition key (made by Neiman), I had an original key (by Huf) that fit the glovebox only, a different original key (Huf) that fit the fuel filler flap and the both doors, and a non-original key (Ymos-like) that fit the trunk only. I wondered what keys and locks were appropriate and original for my Ponton. I used to own a Mercedes-Benz Type W105 219 Ponton sedan that had different door, fuel flap, and trunk key combinations, so what about other Pontons? First, I read Anthony Tugwell’s excellent article. Next, I launched a thread on the International Ponton Owners Group (IPOG) Yahoo! Groups site. Then, I made enquiries on my own. Following are the general conclusions about keys and locks that emerged from this effort. 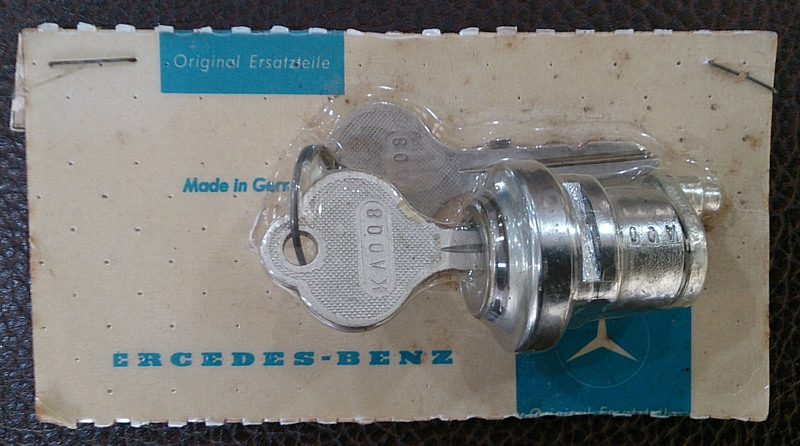 The ignition key for all Mercedes-Benz Pontons including the Type W121 190SL roadster (and many W110 / W111 / W112 "Heckflosse" / "Fintail" series Mercedes-Benz vehicles) was always by Nieman. For Pontons, except the 190SL, the initial number on the Neiman key was 8 (eight). This was the profile indicator. Following that were four numbers. These were the cutting codes. 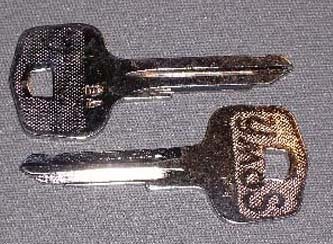 Every Ponton ignition key has a number between Neiman 81111 and Neiman 85555. One thing this means is that all Ponton ignition keys, except that for the 190SL, can be inserted fully into any Ponton ignition lock, but it will not turn the lock unless the code is correct or very close. “Very close” is occasionally possible because of wear on the lock’s internal parts and/or the key’s teeth. This also means that there were only 625 ignition key and lock combinations possible; that is, 54 (5 to the power of 4) 1. Given the number of Pontons produced - in the scores of thousands - multiple cars received the same lock and key. No one for a very long time has located any original Neiman key blanks of the Type 8 profile.6 Many have tried. Apparently the search has been long, frustrating, and unfruitful. As part of my research for this article I undertook an exhaustive search for original Neiman blanks for the Neiman Type 8 profile in Europe and the United States. I was both surprised and gratified to locate and purchase -not cheaply- a handful of original blanks of the Neiman Type 8 profile. I believe these to be the last original ones anywhere. I know they work because they all insert into my own 220S ignition lock. See Photo 1. The Neiman keys were largely steel. The Mercedes-Benz Classic Center supplies steel-content blanks manufactured in Germany, but they are not Neiman. Most aftermarket blanks available today in the United States are nickel-coated brass. Modern European blanks often have a steel content to some degree. Key codes are stamped on the outside of the lock cylinder. The ignition lock must be removed to view it. The codes for the original ignition key are available from the factory data card. A cursory search turned up very limited current information about the Neiman company. Apparently Valeo, a French conglomerate bought Neiman AG, a veteran German firm, in 1986 or 1987. It set up, via a subsidiary, an ignition system production line in Malta. In 1990 Valeo divested itself of its production of at least some automobile ignition systems. The Neiman production was sold to an intermediary and again to another firm in Malta called Ketek International. Along the way, production of Neiman keys ceased. If the stocks of Neiman blanks were consolidated and sold anywhere, I did not unearth any information about it. 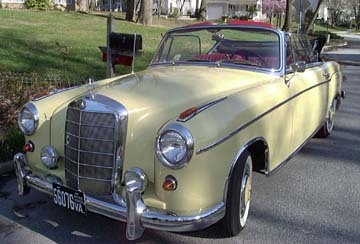 Recall that Neiman keys for Mercedes-Benz Pontons always began with an 8, indicating the profile/series. 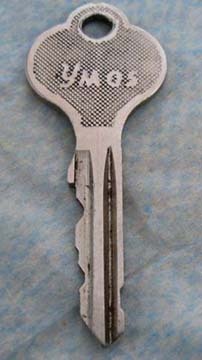 The picture below shows an early replacement Neiman key that has only an 8 stamped. The previous owner of my Ponton obviously purchased a Neiman replacement while they were still readily available. 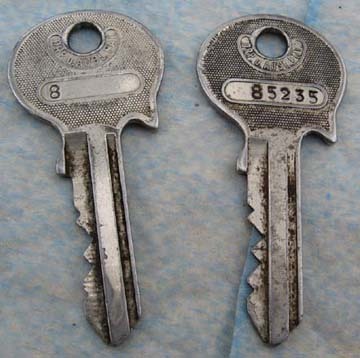 At the time Neiman 8-profile replacement keys came thus marked. See Photo 2. Ymos keys and Huf keys were used variously for door, trunk, and fuel filler locks. Almost always Huf keys were used for the glovebox lock; rarely Ymos. Ymos. Original Ymos keys and modern Ymos key blanks are mostly steel. Ymos AG apparently is still in business in Germany 2, although it sold the security systems portion of its business, in Germany and Italy, to Valeo, the French conglomerate, in 1996. From what I could further determine, in late 2000 Valeo closed the production site 3 that it had acquired from Ymos AG. Key blanks, though, are currently available. Note the different placement and size of the script. Note the different shape of the head. Huf. Huf is still in business in Europe and may supply blanks for Pontons directly to consumers 4: www.huf-group.com Huf blanks are also available through the Mercedes-Benz Classic Center. They may also be available at: S&S Imports. Some are definitely available at: www.keyprof.com and possibly at: www.kaeferschluessel.de. 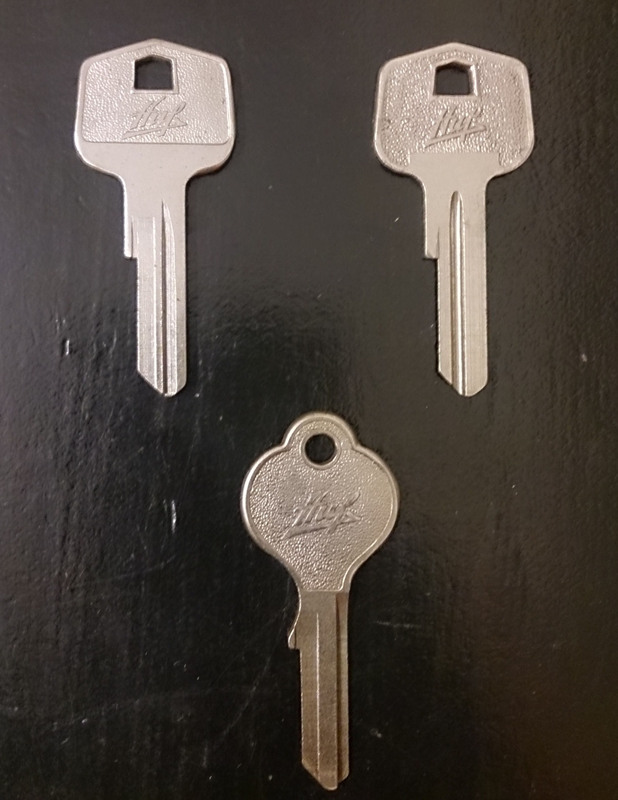 These three Huf keys pertain to my 1959 Type 220S cabriolet. The one on the right with the round head is original and fits the glovebox lock and, originally before the lock was changed, the trunk. The key in the center is the original one for the doors and the fuel filler cover. Note the different shapes. The one on the left is an early replacement, cut to code, for the round-headed one on the right in the picture. Its head bears some similarity to the heads on Ymos replacement blanks shown above. 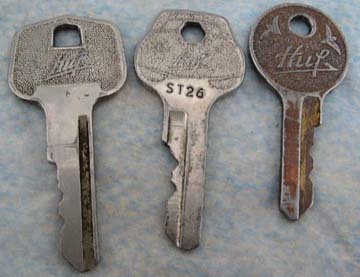 Note the different shape of the key head. It is Ymos-like. When an outside passenger door lock was fitted originally, either as standard or as an option, it was always coded to use the same key as the driver door. Passenger door locks were standard on all 220S and 220SE models beginning sometime in 1958 or late 1957; before that, optional. Information I have received leads me to conclude tentatively that beginning in late 1957 or early 1958, the passenger door lock became standard fitment on US-specification 220S/SE Pontons. The 219 received passenger door locks only as optional fitment. The W180 220a Ponton did not have a passenger door lock as original fitment. I do not know if it was an option. The owners manuals for the 190b, 180b, and 180c indicate that the passenger door lock was standard fitment to these models. Although I did not have access to the owners manuals for the diesel counterparts to these models, I suspect they too will indicate passenger door locks as standard fitment. Whether one outside door lock or two, the door lock key always fits both doors as well as the fuel filler cover. When no glovebox was originally installed, the same key usually (probably always) fit the door(s) the fuel filler cover, and the trunk/boot lock. I did not learn of any situation where this was not the case. In these situations, the key was usually, if not always, Ymos. I learned of no Ponton where a Huf key was used in this situation. The glovebox lock was standard fitment only on 220S and 220SE cabriolets and coupés. It was optional fitment on the 219, 220S, and 220SE sedans. It was also an option on the 180c, so presumably it was an option on the 180Dc. I found no indication of original fitment of optional glovebox locks on any other four-cylinder Pontons (190SL unknown/unresearched). Being standard fitment on the cabriolets and coupés, the glovebox lock was always identical to the trunk lock on these cars. The same key fit both locks. The locks had the same code. The key was by Huf in all instances of which I have knowledge. The great majority of the glovebox locks were made by Huf. A small minority were made by Ymos. Most of the time when a glovebox lock was optionally fitted, the same pattern occurred: the same key operated the glovebox and trunk locks. Both locks had the same code. Again, in all situations of which I have knowledge, the key was by Huf. I said “most of the time” above. I know of one instance where a 219 received a glovebox lock as original optional fitment, but its key fit only the glovebox lock. The other key fit the door, trunk, and fuel filler flap locks in the manner of cars lacking a glovebox lock. Usually when a glovebox lock was supplied, its Huf key also fit the trunk lock. When that happened, the door and fuel filler flap keys were different albeit identical (usually Ymos, occasionally Huf) with each other. Occasionally, however, Daimler-Benz confounded the situation. Once in awhile a Ponton originally fitted with an optional glovebox lock received the same key (usually Ymos, occasionally Huf) for the door, fuel filler flap, and trunk but a unique key -always Huf- for the glovebox lock. Recently, I chanced upon a NOS Ponton trunk lock with its original pair of YMOS keys, and was lucky enough to be the highest bidder on eBay. Though I have occasionally seen NOS locks and keys, I had to buy this as it was still in its original unopened packaging; the lock and keys were wrapped in moulded plastic on thick paper. The reverse has the part number (01207500084), which matches the parts catalogs. In fact, I am tempted to leave it untouched and unopened just to preserve it in its original state. I thought a few photos of this piece might be included on Doug Broome's or Anthony Tugwell's excellent articles on Ponton locks and keys. 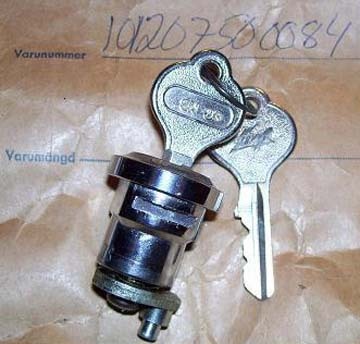 This is a NOS OEM replacement trunk lock with a matched pair of YMOS replacement keys. 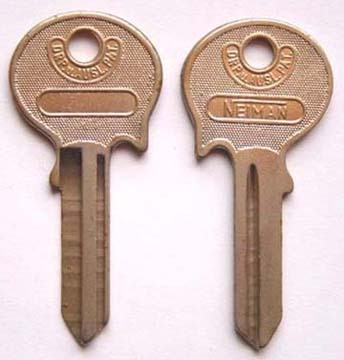 While going through Doug Broome's article on Ponton keys, a small part of a sentence grabbed my attention; he wrote that the Neiman profile 8 key blanks for the Ponton ignition and steering lock were nearly impossible to obtain and that perhaps, the ones he had purchased were among the last (if not the last), unused Neiman blanks for Pontons. 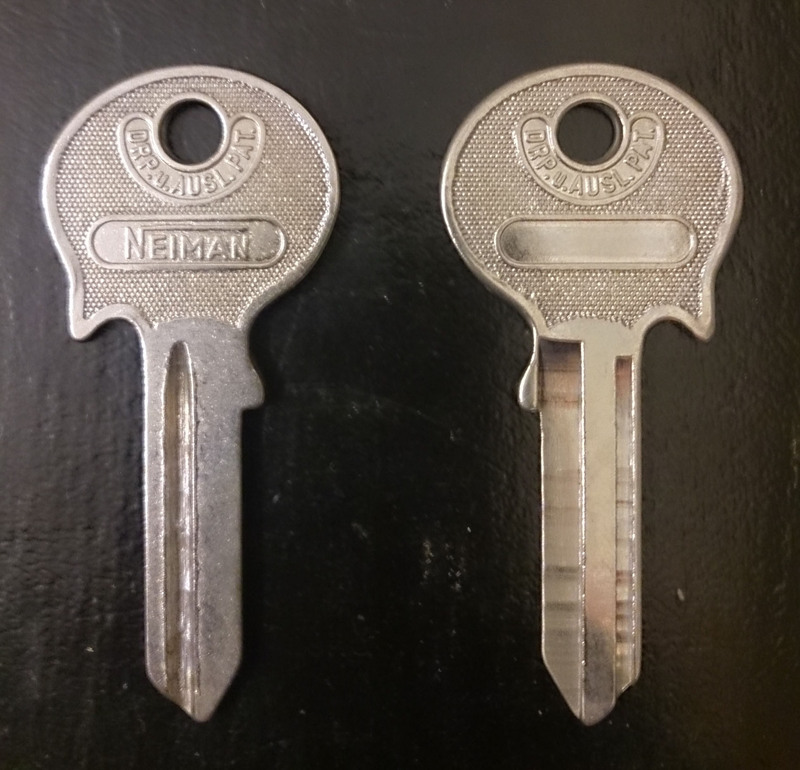 Well, I am happy to report that after a few years of searching, I have obtained an uncut pair of Neiman profile 8 key blanks (their rarity compelled me to buy two in spite of the cost). These were listed on German eBay and I couldn't believe it when I chanced upon them. Three identical blanks were listed, and though I contemplated buying all of them (come on, they're rare! ), I eventually felt magnanimous enough to let one pass to another lucky Pontoneer. As far as price was concerned, I will not say that they were cheap but in relative terms, they were not ridiculously over-priced either. Of course, I cross checked authenticity with Doug before I bought them. Along with the Neiman pair, I also bought a pair of the relatively common HUF key blanks for the driver and front passenger door locks and another HUF key blank for the fuel (gas) lid lock. Earlier, you published the NOS YMOS trunk lock and key set I purchased on the website. These latest key blanks now complete the list of keys needed for my 1958 Type 180a sedan. Since this is an update on the hunt for Neiman 8 key blanks, I thought it may be of interest and perhaps be included on the site. Attached are photos of the keys I bought. The fuel filler flap lock always used the same key as the door lock(s) originally. Often this was Ymos, sometimes Huf. When a glovebox lock was not fitted, the one key operated the door, fuel filler cover, and trunk locks. Usually when this happened, an Ymos key was used but not always. There are very few blanks with high steel content available in any key market. 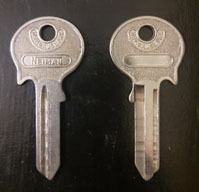 Generally blanks are made of brass or nickel silver, with the nickel silver being a bit more expensive (and not very likely to be available in this keyway). Steel and aluminum blanks are generally considered to be inferior due to their tendency to snap instead of bend when stressed and steel keys will prematurely wear out the brass pins/wafers in the locks. That being said, European aftermarket blank suppliers such as Silca (Italy) do use more steel in their blanks than their American counterparts, but from a locksmith’s point of view I would suggest to steer clear of any key that has steel in it. I do not try to evaluate this comment, as that would digress. I note only that it came from a skilled Canadian locksmith familiar with automobile locks. Perhaps contrary views exist. Note the mention of Silca in Italy. That firm owns Ilco, a familiar American supplier of blanks. What this means for steel content in the respective blanks, I do not know. The 190SL group has faced the same problem with keys. Owners of the Type W121 190SL Ponton roadsters seem to be better situated, at least with respect to original Neiman ignition key blanks, than the Ponton sedan coupé and cabriolet owners. The 190SL received keys of Neiman’s W profile. Original blanks appear to be available for the 190SL although one may have to hunt. I came across a vendor in Texas who claimed to supply original Neiman blanks in the W profile. European vendors may have some stock. The situation for Huf and Ymos key blanks for 190SLs may be similar to that for the Pontons. Original Neiman blanks do exist for some old German brands like Porsche and VW. I have to wonder whether they can also be found in the marketplace for more recent Mercedes-Benz like the W110, W111, W112 Heckflosse / Fintail series. I did not investigate as I did not ascertain the Neiman profile for those keys. I can say for certain that the Neiman 8 profile keys did not fit the Mercedes-Benz "Fintail" (Heckflosse) series. Other than what I discuss above, I discerned no particular pattern as to when Daimler-Benz decided to fit Huf or Ymos locks in the Mercedes-Benz Ponton passenger vehicles. Which lock was used at any moment, Huf or Ymos, more likely than not related to market and contract circumstances with the suppliers; that is, commercial considerations, not technical ones. The Huf and Ymos locks on Pontons appear to be very similar and rather crude. Several Mercedes-Benz Ponton owners have discovered that one or more of their locks has been changed. The original Huf and Ymos locks seem rather crude and simple. Lock failure doubtless happened on some cars. Steel keys were more prone to snapping because of tensile strength. The shape, length, and composition of the Ymos keys in particular suggest that they may have been somewhat prone to snapping off. Owners quite possibly elected to buy a new lock when that happened, not thinking that a locksmith could extract the key shank. The price of new original Huf and Ymos keys, and cutting them to code, suggests that one may be well advised to remove and examine the lock to verify its code before ordering a new key based solely on the data card. That will avoid a frustrating and expensive mistake. The usual disclaimers apply. Use the above information with caution and entirely at your own risk. No guarantees are promised or implied. Thanks to the many members of the International Ponton Owners Group (IPOG) for taking time to examine their keys and locks and to respond to my requests for information. Some sent pictures that I used. Particular thanks go to Bill Coke, Jim Graham, and Anthony Tugwell for review of, and comments on, this article before publication. Finally, my usual thanks go to Jeff Miller for the time and effort it takes to format the document and make the final edits. Responsibility for errors, however, is mine alone. Readers with different information please contact me so that I can make necessary additions or corrections. 1 As seen in Anthony Tugwell's article, there are five code numbers referring to five depths of cut (1, 2, 3, 4, 5). That means there are five code numbers, or cut depths, for each of the four valley/tumbler locations. In mathematical terms that is 5 x 5 x 5 x 5 = 625. 2 The definition of the acronym YMOS is: "The YMOS name, which stands for You Must Observe Security, obliges us to a holistic quality." Cute. The web address www.ymos.com is an uninteresting dead end. 3 The site produced mechanical door locks and steering column locks. 4 I received a communication from Huf that it might be willing to supply me with original keys cut to code. The message implied, however, that the cost would be very substantial. 6 The aftermarket part numbers for this Neiman blank are Silca # NE2, Ilco # 63JA/MB9, Taylor # 63JA, and Curtis # MB6.